Foxride Blake will come here to me in end of october and stay until early spring. Videos, pedigree and pictures below. I saw him when he was a bit over 1 yo and fell in love in the type and his work. He has the lock on sheep, the drive and moves I really like + a really nice pedigree. I will use him on Lass as I planned a long time ago. Blake competed in last years nursery series with Mosse Magnusson and won two of the trials on big courses. Also started a open trial but as he should continue in nursery class they did not follow thru. After that he has been used as a workdog doing lambing and general farmwork. He loves holding single ewes but is still open to work on big flocks of sheep. He has a good will to please. 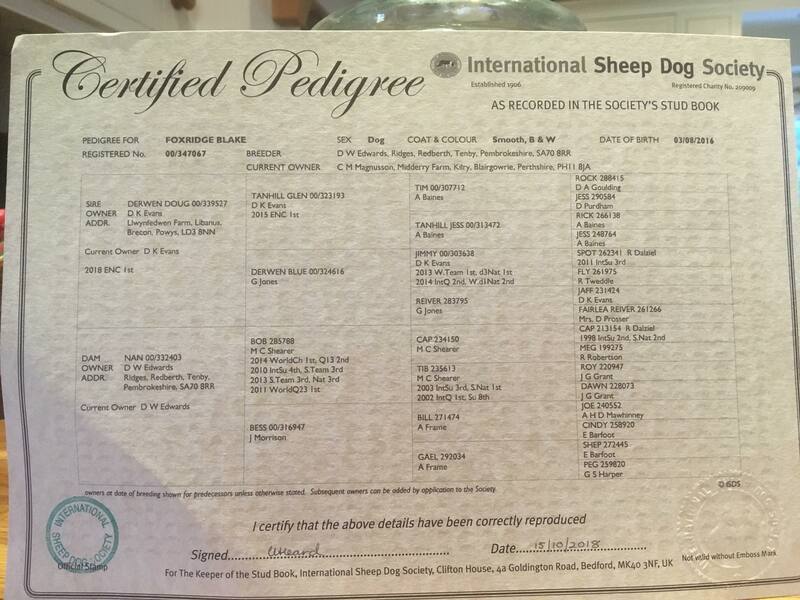 His pedigree is very nice with many good both work and trial dogs. His father is Kevin Evans Derwen Doug that has many trialwins, he also won the ENC this year. Doug is after Tanhill Glen that speaks for himself. On his mother side we have Nan, she has produced several of nice pups with different dogs. She is after Micheal Shearers Bob that won World Trial 2014. Blake is x-rayed with 8 (0-12 is Excellent hips), eyetested free and also DNA Normal for CEA, TNS, IGS, MDR1, NCL, prcd & DM. Nästa Nästa inlägg: Nordic Nursery 2018!